I’ve been lucky enough to have been exposed to some pretty damn good cafés in my time and my recent trip to Europe was most inspiring. There is a real movement towards eating healthier and more holistically. Naturally, the progression towards raw and vegan food was well noted, as organic shops, super markets, café’s and restaurants are offering more raw and vegan options. For more information on the benefits of eating raw, have a squizz at my recipe for Sprouted Quinoa, Pistachio and Pomegranate Salad. That looks so delicious and healthy too!! I love that it is raw as well! Great dessert! 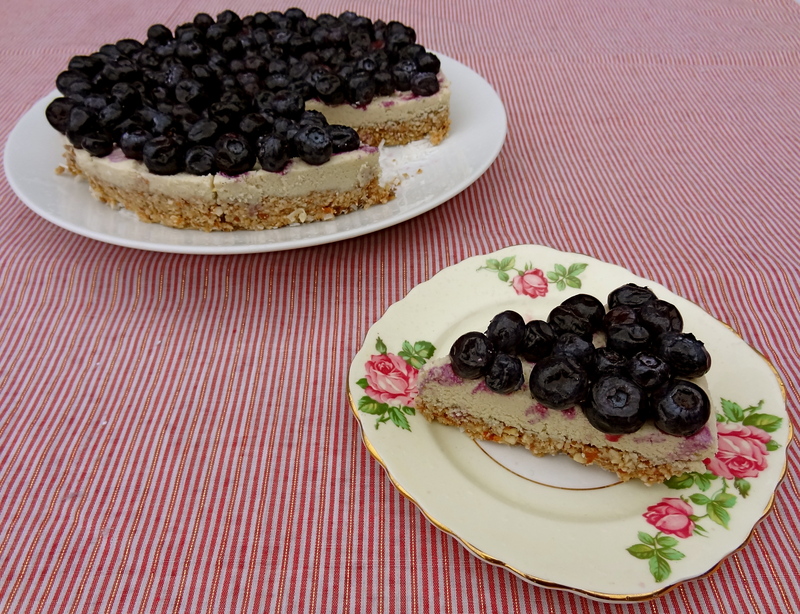 Thank you so much for this recipe, we recently made this cheesecake, it is amazing! It’ll be going on our vegan xmas dinner list. I like your blueberry vegan cheesecake. I make cheese cakes also and sell them along with other goodies. I would like to invite you to check out my blog and follow it. I also have food videos, and this one you might likehttp://savorthefood.wordpress.com/2012/11/18/pumpkin-pie-with-a-grain-free-crust/ and also my post titled Grain free cooking…a Wise Choice? While you are there check out the Recipe page, they are FREE to download. I just started a Vegan section and if it is ok I will be adding this vegan cheesecake to it. So come on over and check the blog out. Thanks for your consideration and time. I also love vegan nut based cream cheesecakes! Your version looks really appetizing! Yummm! Just poped over to see what you have cooking. I know your vegan, but your food stuff is amazing. You should check out my Recipes page and click on the cheesecakes..I would give you the challenge to convert them to vegan!! 🙂 Here is the link: http://savorthefood.wordpress.com/recipes/ or direct link to desserts with cheesecake: https://www.dropbox.com/sh/w5aog8hgtnuwg8v/D2Eh2uISEI . Emily..if you except this challenge, I would like to have you as a guest on my blog. If you would like more info e-mail me at savorthefood.wp@hotmail.com. I hope you except. Thanks always for your comments and readership to Savor the food. Hi Chef Randall! I’m not actually vegan, I just eat really healthily (most of the time). I’ll endeavour to take you up on that challenge! Thanks.